This time, I’m going to compare two speakers from different companies. 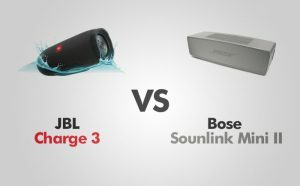 One of them is Charge 3 from JBL and the second one is the second edition of Soundlink Mini II from Bose. Each company has its own style that is reflected in the design of their speakers. Let’s take a look at the build and sound quality, connectivity and battery life. After this comparison, you will be able to determine which speaker is better for you. Charge 3 is available in a few different colors – black, blue, gray, red, turquoise. When you take it out of the box, you can feel that you deal with a premium device. The speaker feels sturdy and well made. It’s a combination of a hard durable fabric and rubber on both ends with the red JBL logo on the front. With this model, it’s not only splash-proof like Charge 2, but it has an IPX certification. This means it’s completely waterproof, to the point that you can submerge it into water up to one meter for 30 minutes. It’s light enough, so you can even take it outdoors near the pool and if it tips over it will float. At the bottom, there are LED indicators showing you how much battery left and the charging status when plugged in. Behind the rubber snap-shut, there are two USB ports. One is used to charge the speaker and the other one to charge your phone or tablet. Since the original Mini, the design hasn’t changed very much. It’s still a mix of a stylish look and good sound closed in a small package. Now, instead of the combination of carbon and pearl, Bose decided to use separate colors for each speaker – carbon and pearl. Bose has a bit different style than JBL when it comes to speakers. It’s not spherical and the speaker is not waterproof or even splash-proof. It’s a slightly curved block of aluminum, small enough to carry it in one hand and take on a trip, but rather in your backpack because it’s definitely too big to fit in a pocket. On the top of the speaker, there are the following rubber buttons that match the color of the device. Press and hold the power button to find out how much battery life has left. You can use the same action to the Bluetooth button to check to what device the speaker is currently connected to. The multi-function button is used to switch tracks or activate sound assistant like Siri. Bose resigned from placing the AUX button on the device in favor of the automatic switching to the Aux input when the device is plugged in, helping the device to look less cluttered. On the side of the device, there is a 3.5 mm jack input that lets you plug a device if you don’t have or don’t want to use Bluetooth. There is another feature that wasn’t available before, namely a microphone to take calls. It works well and picks up voices with a good degree of clarity. The one thing that I don’t like about aluminum cases is that it won’t look that great after it ends up getting a few scratches. So if you want to last and look good, take a proper care. 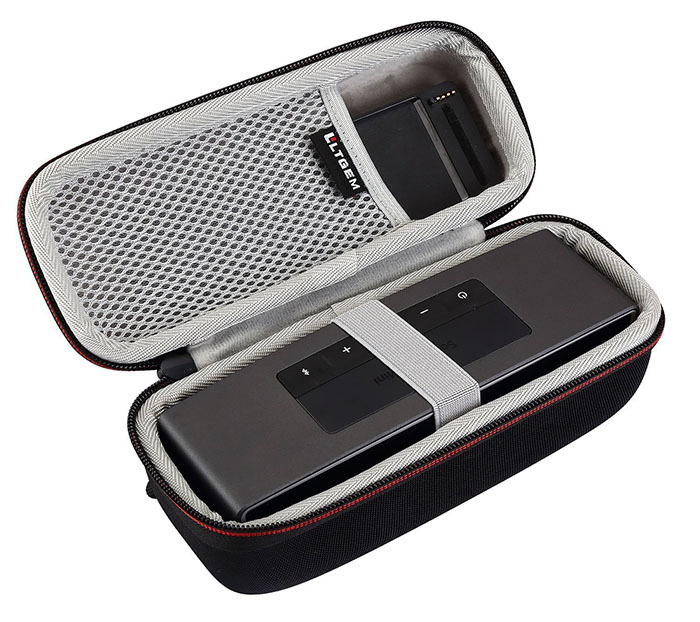 If you are afraid of damaging the device, Bose sells covers separately. The Charge 3 speaker can get pretty loud in comparison to Charge 2. I was impressed by the bass it can produce from these two small speakers. This is achieved by adding dual passive radiators, which are speakers without a coil or magnet to create a better sound in the low end. Check the video made by Definitive Technology to learn more. It has clear mids and highs. But if you turn the volume up too much the treble can get a bit harsh. But this speaker can get pretty loud, so you probably won’t have to crank up the volume that much. Charge 3 is equipped with two 50 mm front-facing speakers, so you can forget to have a 360 degree sound experience. Make sure that the JBL logo is always pointing in your direction. Because this is a small speaker where the drivers are close to each other, you won’t see much of a stereo separation. But if you want you can use the JBL feature called JBL Connect. You can connect multiple JBL speakers to fill your room with sound. Bose hasn’t changed much to the sound signature of the Soundlink Mini II. The original Mini was able to produce great sound despite its tiny size, and this model does as well. It plays a lot bigger than it looks. It has a powerful-sounding speaker and, similarly to JBL Charge 3, passive radiators to produce better sound at the lower end of sound frequencies. If you want the best bass in the smallest form factor as possible, Mini II will be your best option. I think that Charge 3 is more bassy, but it’s also larger and can sometimes overwhelm the high frequencies. Highs are energetic and create great sound separation between instruments, without colliding with vocals. Because of its small form factor, you don’t really get a stereo separation. In JBL speakers you can use the JBL Connect feature to connect the second speaker to augment the sound, you can’t do this with Soundlink Mini II. I didn’t notice any distortions and Mini II performed well at any volume levels. With the second edition, Bose added a microphone to the speaker. Now, the Soundlink Mini II can also be used to make phone calls. Overall, the sound is similar to the original Mini, but it’s not a bad thing. If you compare it to the speaker its size it often comes out on top. The JBL Connect feature allows you to connect multiple JBL speakers and play them in sync, offering better stereo separation. In order to pair the speaker with a device, press the Bluetooth button and find the device listed on your phone. It will connect automatically each time it’s turned on. I was able to keep the connection over 40 feet through multiple walls. With Soundlink Mini II, you can pair two devices at the same time, you can switch back and forth between the devices, but you can play music from only one at a time. The maximum number of the devices the Mini II can remember is 8. Turn the speaker on and it will automatically enter the pairing mode. You will know this because the speaker identifies your device by name, using text-to-speech. JBL Charge 3 offers a 6,000 mAh battery that can last about 20 hours. The JBL speakers offer a great feature that most other speakers lacks, namely the speaker can be used as a power bank to charge a phone and play music at the same time. Mini 2 offers two ways to charge – one with the standard micro-USB cable that is located on the left side of the speaker. The second, by placing the speaker onto a plastic cradle. This charges the unit thanks to the metal pins on both the speaker and the cradle. If you are on the go, you don’t have to take the cradle with you, but you can charge the device from the standard micro-USB port. The battery life has been improved from 7 hours to 10 hours. It’s not bad but it still looses with Charge 3 in this category. PROS: Volume level / Battery life / Midrange / IPX7 waterproof / JBL Connect / Small and portable / Power bank / Sturdy / 3.5 mm input jack / LED indicators. PROS: Cradle / Multi-function button / Great sound quality at every volume level / Small form factor. CONS: Treble can be harsh at higher volumes. CONS: Can’t use multiple speakers in sync. If you need a powerful sound and you often use your speaker near water you should go with JBL. Bose Soundlink Mini will be great as a room/kitchen speaker offering better sound quality at the high end.